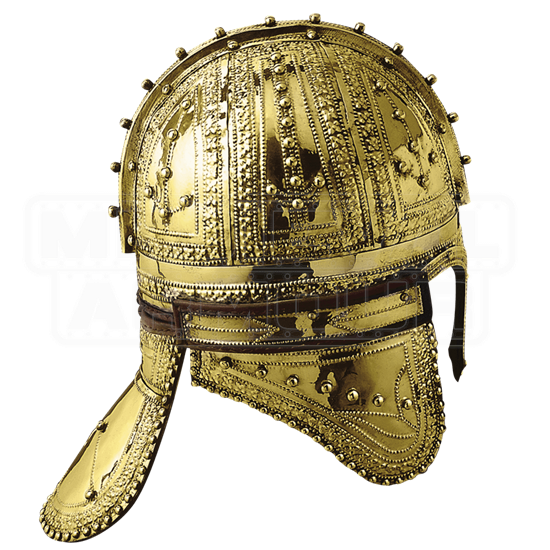 Named after the region of the Netherlands in which the original helmet was found, this Brass Deurne Helmet is an incredible reproduction based off of an actual historical helmet that featured amazing and attractive decorations across its surface. Like many Roman helmet designs, this helmet is quite defensive, featuring a rounded cap that has been reinforced by a ridge down its center, as well as a rear neck guard that keeps the back of the neck protected. The helmet also features attractive decorations across its surface, including stylishly placed rivets and elegant embossed patterns. The end result is a helmet that is as functional as it is attractive. This helmet is made from quality metals and features an attractive polished brass finish. Collectors of Rome-era items will find that this Brass Deurne Helmet is a great way to include an actual historical piece in their collection that is both functional and attractive.